With Black Lives Matter in the news in the US it is perhaps no surprise that fiction and non-fiction explorations of slavery are once again coming to the fore. Fiction which focuses on slavery, while important to an understanding of historical context, also casts a light on current events. 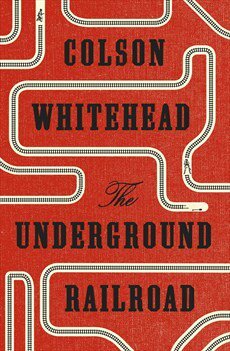 Recent films like 12 Years a Slave, the remaking of Roots on TV and now, among a number of new books which take slavery as their focus, comes Colson Whitehead’s The Underground Railroad. The Underground Railroad begins with the origins of the slave trade. The story of Cora’s grandmother who was transported to America and passed through a number of hands before arriving at a cotton plantation in Georgia from which she never left. But the focus of the novel is on Cora, forced to find her own way after her mother escaped from the plantation, when she was eleven, leaving her behind. Cora, encouraged by a fellow slave, also decides to flee despite the severe and violent consequences of failure. When she does, Cora discovers the underground railroad used to transport escaped slaves North. In Whitehead’s world this is no metaphorical device but an actual railroad dug into the earth by unknown hands, run by white station agents committed to helping runaway slaves. Whitehead does not belabour this imagery, the railroad itself is used sparingly as Cora tries to navigate her way to freedom. But it is a powerful and enduring reimagining of this institution. Cora moves from state to state finding a completely different situation in each location, none of which conducive to the life she wants to live. In South Carolina, for example, the former slaves appear free but are still actually under the sway of white doctors and a dangerous reinvention of the past. The population of North Carolina has tried to rid itself of slavery by killing all of their slaves and taking in poor European migrants instead. The differences are so stark that Cora’s journey starts to feel a little like Gulliver’s travels. And perhaps to make the point, Swift’s classic novel which laid bare many of the hypocrisies of its time, also gets a mention. “Here was the true Great Spirit, the diving thread connecting all human endeavour – if you can keep it, it is yours. Your property, slave or continent. The American imperative”. But, despite all of the violence there is optimism here. Cora, through her journey sees and experiences something other than this imperative. A massive feat of engineering, an underground railroad, built solely to save people like her. And just as important, the people who put their lives at risk to help her, those “who took runaways into their homes, fed them, carried them on their backs, died for them”. The underground railroad made real is described as a “secret triumph” representing “a new nation, hidden beneath the old”. The Underground Railroad does not pull any punches. Cora’s path is not an easy one and the action is often confrontingly violent. Whitehead based the novel on, amongst other sources, a project from thirties which collected the life stories of former slaves. The authenticity of these stories is heightened by the slightly fantastical nature of the setting. While ostensibly a historical novel, Whitehead manages to deeply explore and reveal the schisms in modern America. But he, like Cora is ultimately optimistic and maybe books like this one can help move the debate forward and help to reveal that America that is too often hidden.